Prishtina is the cultural, economical, and administrative center of the Kosovo with a long history. In a full day tour to Pristina, you can discover archeological sites, monuments protected by UNESCO, very old Ottoman places, narrow stone streets and attractive tall buildings. 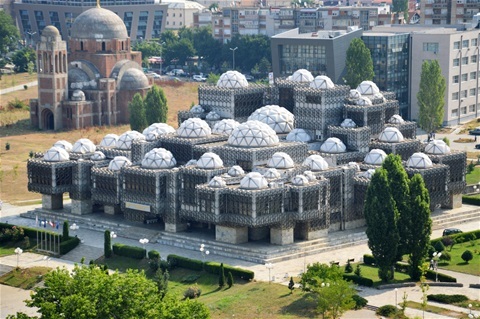 We will walk through the capital exploring its main attractions including the Mother Teresa Cathedral, National Library (at the picture), the Monument of Scanderbeg (Albanian National Hero), the Clock Tower, Kosovo Government building and the "New Born" monument which is becoming the symbol of this new state. Of particular interest are the Ottoman period mosques of Prishtina with probably the most beautiful, being the Fatih Mosque dating back to 1461 during the golden era of Sultan Mehmet II. Its huge ceiling domed cupola crowns a splendidly painted floral interior of Arabesque design. Nearby is Pristina's oldest building, the Çarshia Mosque completed in 1389. We end our tour with a visit to the Ethnographic Museum situated in a typical Ottoman architecture house, beautifully stocked with original artefacts which testify to the traditions and way of living of the people in Kosovo.